These shows are already sold out, but you’re a New Yorker. Go early! Scalp some tickets! It’s raining, surely some people won’t show up. Go to stubhub or Craig’s List, because you want to get in if you can get in. 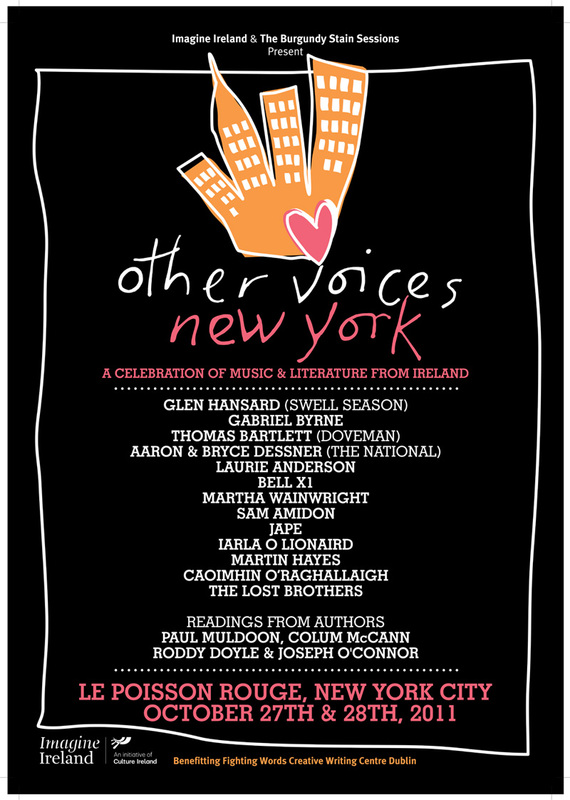 Tonight and tomorrow at Le Poisson Rouge, Philip King’s acclaimed Other Voices series will play NYC for the first time. And also, new to Other Voices, there will be not only trad and rock music, but also words. The event benefits Fighting Words Creative Writing Centre in Dublin. Exclusive comments from Philip and Caomhín below, and some video! Other Voices began 9 years ago, in a 200 year old church in Dingle, the Church of St. James, which holds only about 90 people. It was a television show, broadcast every year. Philip King began it with Glen Hansard in 2003. Why? Because he loves the music and wanted to hear it himself! “It’s grown into a safe haven for great music and people from all over the world have been,” Philip explains. People from New York have come over. And the Imagine Ireland initiative made it possible for them to bring it this year. “When I look out my window at home and imagine the nearest parish to the parish that I live in, it’s probably New York,” Philip says. “That connection is there between Ireland and the U.S.” He made a program over 20 years ago called Bringing it All Back Home which explored how Irish music changed and evolved through being in America, and this is a step in the process. In addition to the music, there will be words: Gabriel Byrne, Roddy Doyle, Colum McCann, Paul Muldoon, Joseph O’Connor are on hand, to name a few.